NPR's Staff Diversity Numbers, 2016 : NPR Public Editor Despite the company-wide initiative for diverse hiring, change in the newsroom has been incremental. According to NPR's human resources department, of the 350 employees in the news division as of Oct. 31, 2016, 75.4 percent were white. Asians made up 8.3 percent of the staff, followed by blacks or African-Americans (8.0 percent), Hispanics or Latinos (5.4 percent), those who identified as two or more races or ethnic identities (2.6 percent) and American Indian (0.3 percent). The Ombudsman's office has been tracking these numbers for several years; the comparisons with previous years can be seen in the accompanying charts. Essentially, they show that the numbers changed little, or at least they changed incrementally, in the past five years. There's simply no way around it: If the goal is to increase diversity in the newsroom, last year's was a disappointing showing. It also mirrors a national trend; newsroom diversity has "nearly flatlined" for more than a decade, reports Farai Chideya, in the Columbia Journalism Review. NPR's racial diversity numbers compare favorably when judged against statistics from the American Society of News Editors, which show, "In 2016, minorities comprised about 17 percent of employees at daily newspapers and 23 percent at online-only sites." But up against some of the major newspapers that comprise NPR's peer group of news outlets, NPR is behind The Washington Post (31 percent diverse) and The Los Angeles Times (34 percent). At 25 percent diverse, NPR is just above The New York Times newsroom, which is about 22 percent diverse. The numbers speak loudly, but what interested me was how the newsroom itself feels about the situation. More than a dozen employees of all ranks took time to talk to me, a number of them on the record. Some in the newsroom and upper management at NPR argued that the focus on the raw numbers discounts other changes last year that had the effect of contributing to NPR sounding more diverse on-air. Internal shifts of note last year included the promotion of Lulu Garcia-Navarro from Brazil correspondent to host of Weekend Edition Sunday, which made her NPR's first Latina newsmagazine host. Eyder Peralta moved from the Two-Way digital blog to become NPR's Kenya-based Africa correspondent. KPBS anchor Dwane Brown began as a West Coast-based afternoon newscaster in January 2016. Other changes aren't reflected in the newsroom numbers but are worth noting. On the programming side, NPR in November acquired and relaunched Radio Ambulante, NPR's first Spanish-language podcast, which is also contributing stories to the newsmagazines. And NPR had strong input into the choice of Joshua Johnson as the host of WAMU-produced 1A, the NPR-distributed talk show that replaced The Diane Rehm Show. Chioke I'Anson was hired to read the sponsorship credits for NPR's newscasts and its digital content; funder announcers are among the most widely heard voices on NPR's air. Although not publicly visible, the hiring process has also changed in the past year; most job candidate pools now include diverse candidates, unlike in the past, argued Keith Woods, NPR's vice president for newsroom training and diversity. Far more people I spoke to in the newsroom expressed frustration — some even said they were angry — at the slow pace of change. "The company has been talking about the importance of diversity for many, many years," but changes are not happening, said Marisa Peñaloza, a senior producer on NPR's National Desk. That's despite a number of meetings in the past year between NPR's senior management and a group of Hispanic employees, as well as a concerted recruiting push at last August's joint conference of the National Association of Black Journalists and the National Association of Hispanic Journalists. "It becomes a question of priorities. If you really want to, you can make diversifying staff a priority," said Adrian Florido, a reporter with Code Switch. Peñaloza and others said they are looking for improvement in diversity at the middle level and up. That is partly a function of the relative lack of mobility internally; few mid-level positions open up each year at NPR. "I see a lot more diversity now in the lower ranks. If we really want to make a difference, we need to hire more [diverse] managers," Peñaloza said. "The benefits of diversity are accrued when people of different races and backgrounds are in leadership or otherwise empowered to make decisions. The power structure of NPR (and frankly, many other legacy news organizations) is led by a predictable and racially homogenous set. In fact, it seems that as turnover has happened over the past few years, the high level, upper management of NPR has gotten more male and white. There's nothing inherently wrong with that, but white is not 'neutral' — decisions flow from it. The folks in those positions control the broad strategic direction and major hires of this organization, as well as represent to those of us lower ranks what leadership looks/feels like. Editorially, it means that the most important calls about coverage are coming from a fairly homogenous voice — affluent, older white people and, because of blind spots in their experiences, we lose out on speaking authentically to the very people we want to reach — younger, more diverse America." Hu and others expressed frustration at what they see as problems with the recruiting process. "Recruiting-wise, it hurts us if we want to attract people of different backgrounds (when you look up and see no one like you)," she said. One anecdote stood out for a number of employees last year, when the interviewing panel for a major position at NPR was entirely white. 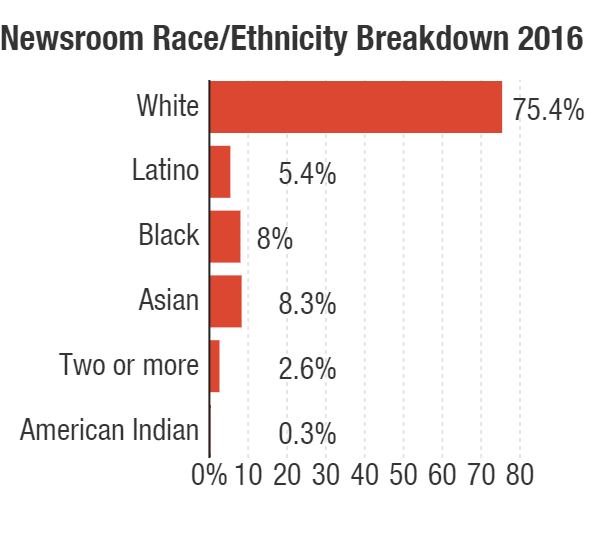 Hiring is one way to increase diversity, but that does not change the newsroom makeup if nonwhite employees are leaving at an equal rate, which is what happened in 2016. Joe Ruiz, weekend editor for digital news (and an officer for the National Association of Hispanic Journalists), was among those who said they were concerned about whether NPR was making enough effort to retain nonwhite employees when they are approached about jumping to other news organizations, citing examples of a number of employees who left in 2016 for rival newsrooms (including at NPR member stations). The retention issue is an industrywide problem, as top news organizations increasingly hire from the same pool of employees, rather than bringing new people into the fold. NPR's news chief Michael Oreskes argued that when NPR employees jumped to member stations, it did not dilute the strength of the NPR system as a whole, adding that NPR is putting in place a plan for greater collaboration between the national newsroom and member stations. But NPR clearly still needs to do better at keeping colleagues from jumping ship, a challenge that Oreskes acknowledged. A repeated theme I heard from nonwhite NPR employees was a need for training, support and mentorship; one employee used the word "isolated" to describe how certain employees feel. While some staff members, including Florido, told me they feel well supported, and have been offered the training and opportunities they need to advance their careers internally, others said they feel as though they have been left on their own to sink or swim. That feeling is particularly prevalent at the mid-manager level, according to those I talked to. In the charts, we have posted the breakdown of the newsroom by gender as well. 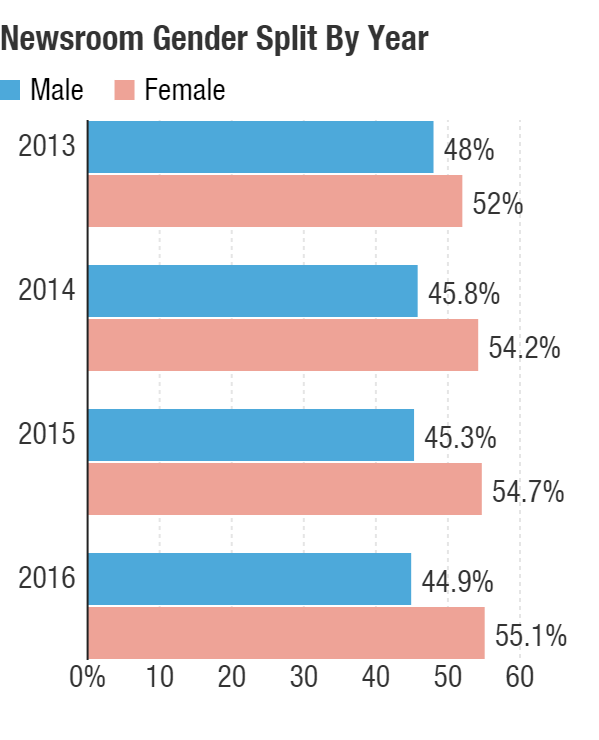 As of the end of October 2016, the newsroom was just over 55 percent female, which shows virtually no change from the year before. That far exceeded the industry average for newspapers, TV newsrooms and radio newsrooms. While the vast majority of the very top executives in the NPR newsroom are male, every newsmagazine that NPR produces — Morning Edition, All Things Considered and their weekend counterparts, plus the Two-Way breaking news blog — is led by a woman, as is Here and Now, which NPR co-produces with Boston station WBUR. In many ways, these are the company's most important news leadership positions because the shows' executive producers are the key decision-makers on a daily basis. That could change now that Woods has recently added the training component to his responsibilities. There are good business reasons for making sure NPR's newsroom is diverse. Newsroom employees detailed experiences of having to argue to convince colleagues that certain stories needed to be covered and others worried about missing nuance. Diversity, said Ruiz, is about "covering your blind spot" so that NPR's coverage reads and sounds like the country as a whole, which has been the company's stated goal for many years. With a number of open positions in the newsroom, the company's diversity has the potential to change dramatically. But as of March 31, 2017, the numbers had not budged much. The news and information division was up to 358 employees, of whom 75.4 percent were white (exactly the same as at the end of October). The percentage of employees who are Hispanic or Latino had inched up to 6.1 percent, however. We will update the 2017 numbers again at the end of the year.